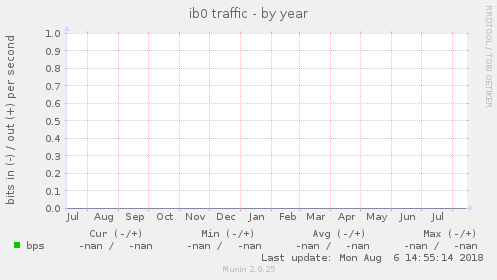 This graph shows the traffic of the ib0 network interface. 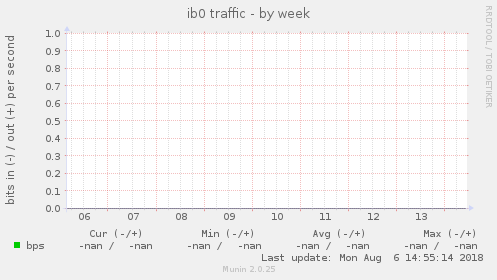 Please note that the traffic is shown in bits per second, not bytes. IMPORTANT: On 32-bit systems the data source for this plugin uses 32-bit counters, which makes the plugin unreliable and unsuitable for most 100-Mb/s (or faster) interfaces, where traffic is expected to exceed 50 Mb/s over a 5 minute period. This means that this plugin is unsuitable for most 32-bit production environments. To avoid this problem, use the ip_ plugin instead. There should be no problems on 64-bit systems running 64-bit kernels. 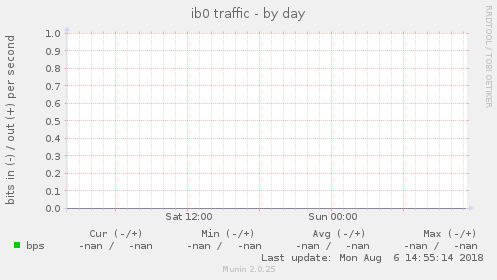 bps up derive Traffic of the ib0 interface. Unable to determine interface speed. Please run the plugin as root. 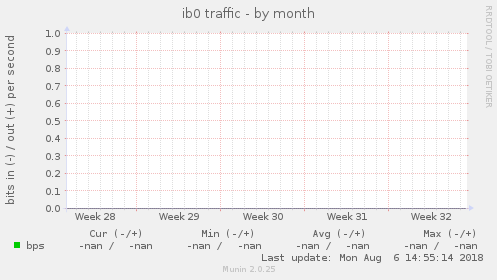 This page was generated by Munin version 2.0.25 at 2019-04-19 20:26:07+0200 (CEST).